A salmon with a label attached is seen at the Cargill research center in Dirdal, Norway, Aug. 1, 2018. Norway has built the world's biggest salmon-farming industry. But it wants to go bigger. With their lucrative oil fields now in decline, Norwegians have ambitious plans for aquaculture to power their economy far into the future. Climate change could make those dreams harder to realize. Salmon feed is based on fishmeal, produced by grinding up wild-caught fish. With warming waters and ocean acidification pushing underwater ecosystems to the breaking point, Big Aquaculture is seeking ways to feed fish that aren't hostage to increasingly unpredictable seas. "Feed has a couple of bottlenecks: We're still using marine resources, for example fishmeal and fish oil, to then put into fish. This is not necessarily sustainable in the long term," said Georg Baunach, co-founder of Hatch, an accelerator focused on supporting aquaculture startups. "And that's why we need innovation in feed." A lifebuoy is seen in front of boats in Stavanger harbor, Norway, Aug. 1, 2018. 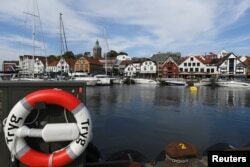 Entrepreneurs, venture capitalists and scientists are racing to identify alternatives, turning the Norwegian cities of Bergen and Stavanger into a Silicon Valley of the Sea. Spending on research and development in Norway's aquaculture sector increased by 30 percent to 2.3 billion kroner, or $275 million, between 2013 and 2015, according to official data quoted by Hatch, as startups and research institutes raced to develop disruptive new technologies. The innovators aren't short of ideas. At Norway's biggest oil refinery, a startup called CO2Bio is harnessing greenhouse gases to culture algae that can then be harvested as a sustainable source of fish feed. At the Institute of Marine Research in Bergen, the Aquafly project is investigating whether black soldier flies fed on waste products from the food industry or the seaweed growing off Norway's coast could be another viable feed ingredient. "The insects are also part of this whole circular economy, where instead of throwing away things you would reuse and recycle and upcycle," said Nina Liland, one of the Aquafly researchers. "Potentially you could use food waste from households to produce insects that could be used for fish feeds: That would be an optimal scenario." Nina Liland, scientist for the Aquafly project at the Institute of Marine Research investigates how insects can be used to make feed for Norway's salmon farms, in Bergen, Norway, July 31, 2018. Various companies are working on projects to recycle more of the vast amounts of waste dumped into the sea by Norway's aquaculture industry into products such as biogas or fertilizer. Researchers are also looking for ways to combat the sea lice parasites that thrive in salmon cages, which are a major brake on the industry's plans to expand. Time may not be on the fish farmers' side. With climate change projected to intensify in the coming decades, the challenge will be to turn promising new ideas into viable projects fast enough to shield their dreams of a prosperous future from the growing turmoil at sea.